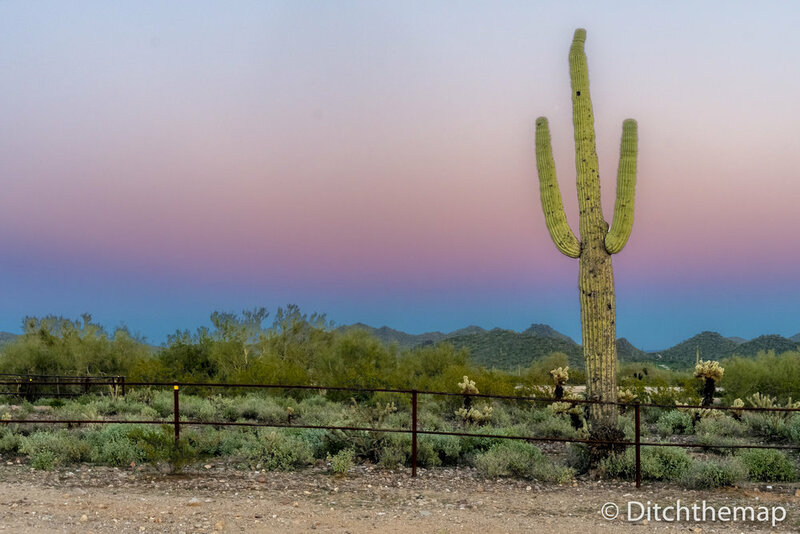 After an unremarkable night camping in Arizona we were back on the road by early morning headed for El Paso, Texas. 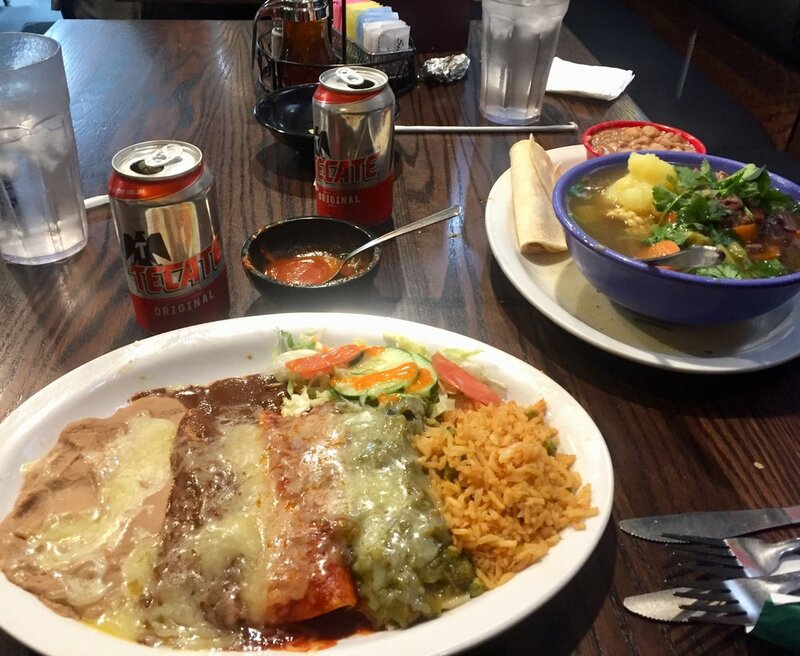 We didn’t have any plans for our one-night stay in El Paso, but figured that because of it’s close proximity to Mexico (right on the border), some authentic Mexican food was in order. With a quick search on TripAdvisor we chose the highest ranked Mexican restaurant, L and J Café, also a local, historical landmark. There was a wait at the restaurant which is always good sign. We sufficiently gorged ourselves on a meal of chips and salsa, soup, enchiladas, red and green chile sauces and mole. Though we left satisfied and satiated, we both concluded that we like a lot more spice! Big Bend National Park was not on our road trip itinerary until it was highly recommended by a friendly Texan we stayed with back in Montana. Several weeks later, here we are, finishing up 3 days of hiking and camping in Big Bend, completely coincidentally at one of the best times of the year to visit. Reportedly summers here are unbearably hot, while in winter the evenings can reach below freezing. It’s late November now and daytime temperatures have reached the high 70’s while nighttime temperatures ranged in the low 40’s. 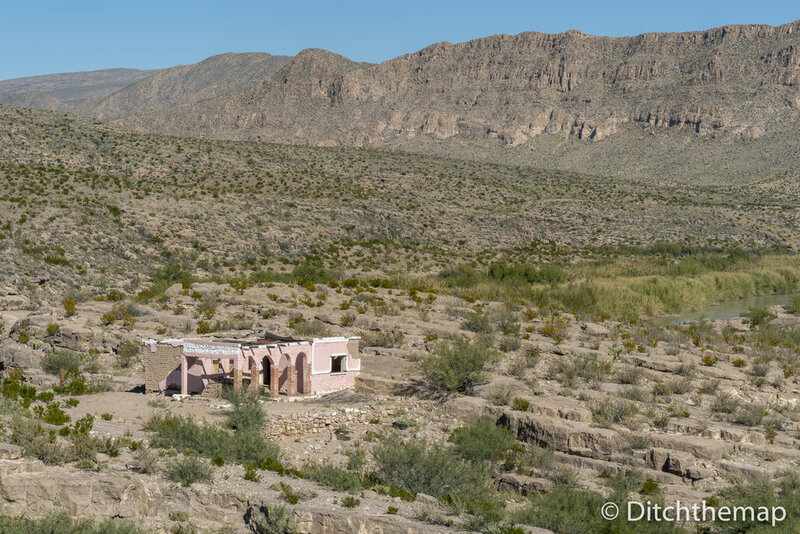 Located in southwest Texas on the US/Mexican border, Big Bend National Park offers a dry and dusty landscape speckled with green shrubbery and cactus. There’s a spattering of rocky outcroppings thrown in the mix. This is one of the least visited National Parks and while admittedly not as beautiful as other National Parks we’ve visited, excels in the area of star-gazing. 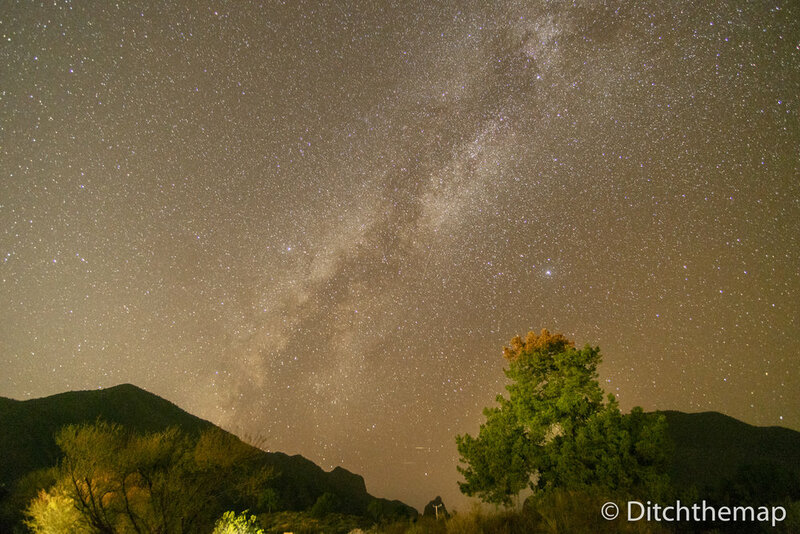 The star-gazing in Big Bend is truly unrivaled. 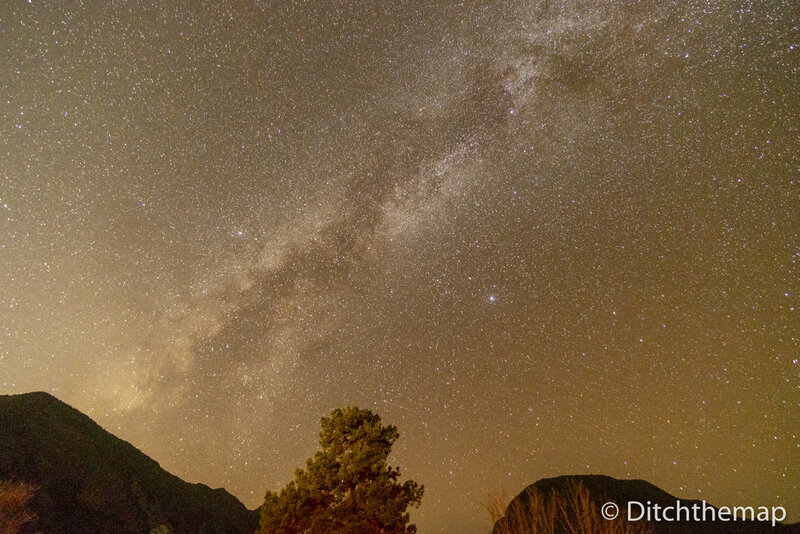 It’s a certified “dark-sky park” because of the lack of light pollution. Driving through the park we had a chance to catch some of the native wildlife. We caught glimpses of coyotes, saw several silly road runners sprinting across the street and dozens of tarantulas in the road with no apparent rush to cross. We were lucky to find a campsite at the most popular campground in the park, Chisos Basin Campground. It’s also the highest campsite in the park with an elevation of 5,400 feet. We arrived at 3pm with no reservation and managed to find three remaining walk-up spots. We’ve had considerable good luck on this trip, especially considering we’re planning only a few days in advance for each new destination. However, we noticed that on Friday the campsite was marked at full so make sure to reserve a spot if you plan to arrive on a weekend. We selected the most scenic camp spot with views of the Chisos Mountains for which the campground is named for. The Chisos Mountain Range is the only mountain range completely contained within a National Park. The campsite included a charcoal grill, picnic table and bear/javelina locker to store all food and fragranced items. This is the first park where we’ve heard warnings of javelinas (wild pig-like animals) though we didn’t encounter any. Our neighbors at the campsite were exceptionally friendly. We hiked the 10.5 mile out-and-back Emory Peak Trail on our first full day in the park. The trail winds up switchbacks until ending in an uphill scramble to the peak. The views from the peak, the third highest peak in Texas at 7,825 feet, are expansive. Fortunately, much of the trail was shaded in the shadow of the mountain on the way up. The hike to the peak, however, was hot and exposed. A courteous rattlesnake several feet from the trail gave a loud rattle before quickly slithering out of sight. We also spotted a few roadrunners on the hike. Including our lunch break, the hike took us about 5 hours to complete. The Rio Grande forms the natural boundary of Big Bend National Park and Mexico and from the park it is possible to cross at the Boquillas Crossing Port of Entry into Mexico. To cross, we entered the port of entry, received a brief overview of what to expect from the customers officer, walked to the river, hopped into a boat and took the 2 minute trip across for $5/person. In retrospect, we probably could have just waded across the river if water levels permitted. Once on the Mexican side, we opted to walk one mile to the tiny town of Boquillas while other tourists were talked into donkey/mule/car rides to the town. The town was small and the single dirt road was lined with cheap knickknacks targeting tourists wallets. We selected one of the two restaurants in the town to sit down for lunch. We were serenaded by guitar while eating chile relleno along the Rio Grande. Passing back to the US was a breeze. Disappointingly, no stamp in our passport for the journey. We ended our afternoon spent in Mexico with a soak in the park’s hot spring at dusk. On our last morning in the park we fit in a quick 3.8 mile out-and-back hike to the “Windows”. Conveniently, the Windows Trail trailhead is located at Chisos Basin Campground. The trail leads into a canyon that narrows into a ravine. Following a creek down the ravine the hike ends abruptly at the top of a waterfall. Steep rock walls on either side of the waterfall give the appearance of looking out of a “window” to the distant mountains. This is supposed to be a great spot to catch sunset.